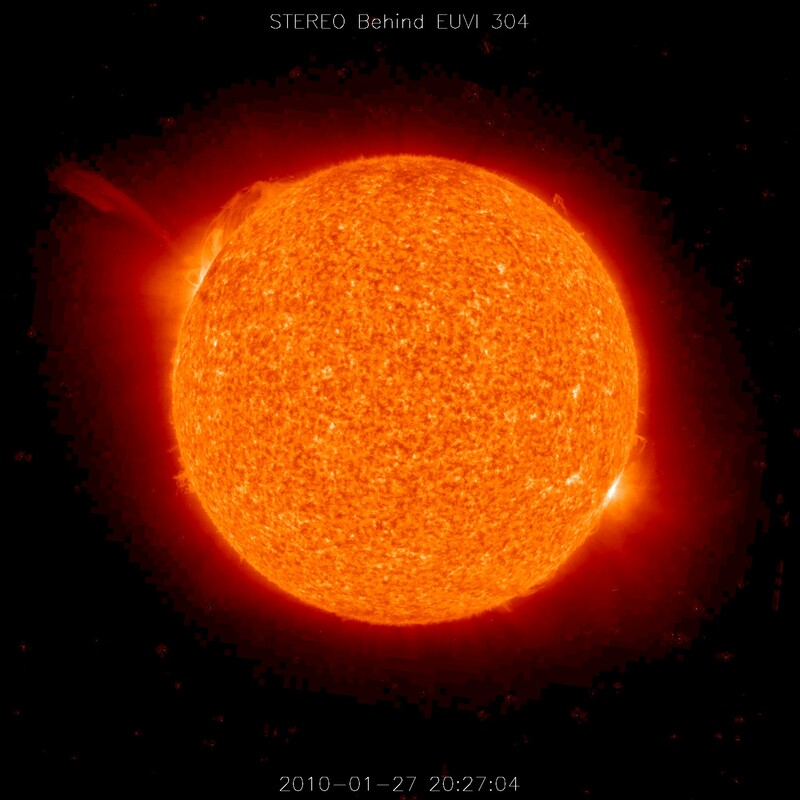 Fiery arcs rise above an active region on the surface of the Sun in this series of images taken by the STEREO (Behind) spacecraft on January 27, 2010. The arcs are plasma, superheated matter made up of moving charged particles (electrons and ions). Just as iron filings arc from one end of a magnet to another, the plasma is sliding in an arc along magnetic field lines. In a movie of STEREO observations made between January 26 and January 29, the dynamic streams were initially just over the Sun’s edge and readily spotted as the Sun rotated them more into view. About mid-way through the movie clip, a small coronal mass ejection (a stream of charged particles from the Sun) shoots out and into space at about a million miles per hour, carrying some magnetic field with it. The top image shows the beginning of the coronal mass ejection, while the lower image shows the solar matter leaving the Sun’s corona. Most coronal mass ejections are more bulbous and wide: this one is quite narrow and contained. Nonetheless, NASA solar scientists agree that its speed and characteristics suggest that it was indeed a non-typical coronal mass ejection. 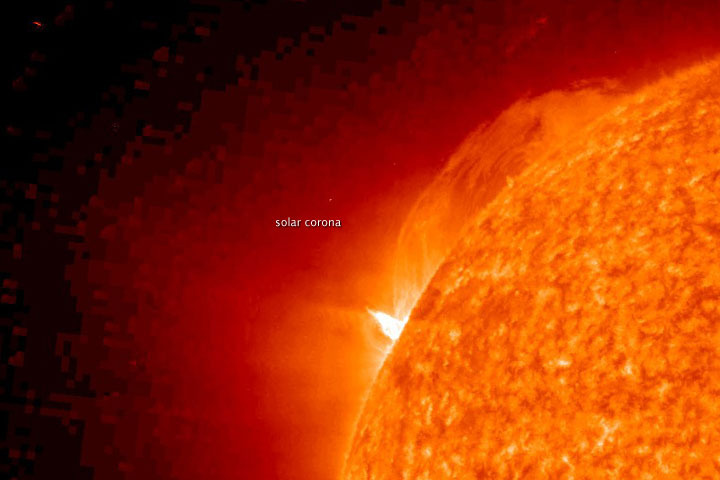 A coronal mass ejection can cause problems on Earth. The energetic particles can damage satellites, cause communication and navigation problems in airplanes, and disrupt electrical power in homes and businesses. To understand the Sun and its effects on Earth, NASA has 17 missions, including STEREO, observing the Sun. On February 11, 2010, the fleet grew by one when NASA launched its most advanced solar spacecraft, the Solar Dynamics Observatory, to study the causes of solar variability and its impacts on Earth. The Solar Dynamics Observatory will take detailed images of the Sun every 0.75 seconds and send 1.5 terabytes of data—the equivalent of 380 full-length movies—back to Earth every day. These observations will help scientists understand how the Sun’s magnetic field is generated and structured, and how the energy in the magnetic field is released into space as solar wind, energetic particles, and variations in solar irradiance. Edson, J. and Cohen, H. FusEdWeb. Lawrence Livermore National Laboratory and Princeton Plasma Physics Laboratory. Accessed February 12, 2010. Hill, S. (2010, February 5). Sliding Plasma and a CME. Solar and Heliospheric Observatory. Accessed February 12, 2010. NASA. (2010, February 5). About the Solar Dynamics Observatory Mission. Accessed February 12, 2010. NASA. (2010, February 11). NASA successfully launches a new eye on the Sun. Accessed February 12, 2010. NASA images courtesy the STEREO Science Center. Caption by Holli Riebeek, based on interpretation provided by the Solar and Heliospheric Observatory Website’s Pick of the Week. Fiery arcs rise above an active region on the surface of the Sun in this pair of images of a coronal mass ejection on January 27, 2010.